Check out a little more about our awesome staff. Our specialized training programs coupled with the employees' hands on experience is why The Runners Forum staff have been considered experts since 1978! Whether you are new to running, walking and endurance sports, or looking to take your performance to a new level, the experienced employees at the Runners Forum are excited and willing to answer any question you might have. Tom joined the Runners Forum team in 2008 as co-owner. 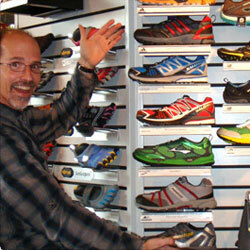 Tom has been a running enthusiast for more than 30 years and enjoys competing in events from 5k to marathon distance. While attending IU, Tom rode Little 500 and has spent 20+ years racing bicycles, prefering hilly road races. After several years of cheering on his wife Sharon and partner Smitty at triathlons, Tom took the plunge and has enjoyed the challenge and benefits of being a multi-sport athlete; in 2010 he completed Ironman Louisville. Tom loves animals. His dog Mia is often at the store where she greets people and brings a smile to the faces of Runners Forum customers. 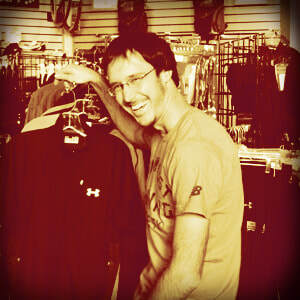 Smitty, co-owner of The Runners Forum since 2004, continues to be one of the best Triathletes in the midwest. World 70.3 age group Champion 2008, in Clearwater Florida (45-49, 2X-Mideast Triathlon Championship - Winner, 4x Hawaii Ironman Finisher and consistent top 20 finisher in Mini-Marathon. Smitty, along with the other owners, actually works in the store and you'll find him helping customers just like you. Come visit Smitty and get the "perfect" fit. He graduated from Indiana University in 1984. Mike and his wife Jennifer have two daughters, Rachel and Taylor. Eric joined the Runners Forum in February of 2018.For over a decade Eric has been using his enthusiasm for fitness and wellness to help people get the perfect fitting footwear. Eric is a graduate from The Second City and iO (formerly Improv Olympics) in Chicago. When he's not in a theater production of some sorts, you can find him playing with his son at a park or at the gym. Jesse joined the Runners Forum team at the beginning of 2014, but has worked in running specialty for over six years. He is an avid runner and has competed in every distance from 100 meters to Ultra Marathons. Most people would tell you his biggest achievement was making the 2012 Olympic Marathon Trials but he would say it was coaching his wife to her first marathon in a time of 5 hours 18 min. He has a passion for connecting runners and walkers with the tools they need to be successful, and is willing to take the time needed to do the job right. Cristy joined the Runners Forum part time in 2015 to be more engaged in the running community and is now our Carmel Store Manager. She and her husband, Geoff, have 4 children. Her running addiction began in 2010 when on a total whim she signed up for the 500 Festival Mini Marathon. She has since ran many races ranging from 5k to 50k with vision to push farther! She enjoys reaching out to help new runners and learning all she can from the seasoned runners. Mike joined the Runners Forum in 2016. He started running in grade school and ran the Mini Marathon at the age of 14. After a long running hiatus and looking to get back to a healthy lifestyle, he rediscovered running at age 30. He has over 10 years of running specialty experience and enjoys helping others discover their passion for running, walking, or fitness. A veteran of races ranging from 5K to the marathon, you will find Mike at many local races when he’s not working at the store. Sherri joined the Runner’s Forum in September 2013. She has been running since age 13 when she joined the school cross country team. Originally from Minnesota, she has lived in the Indianapolis area since graduating from Purdue University. Sherri enjoys participating in various lengths of races from 5K to half-marathons, with the 8K becoming a favorite. She enjoys being involved in the community through local events and find the best part is the support from other athletes. 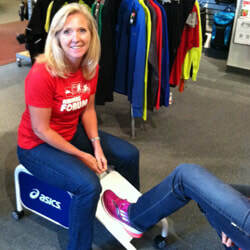 Sherri and her husband Jeff live in Carmel and make running/fitness a family affair with their 2 sons, Colton & Tyler. She finds training so much easier with the support and encouragement of her family. In her spare time, you can find Sherri spending time with family, chauffeuring the boys to various activities, volunteering at school and figure skating. Alan joined the Runners Forum in February of 2011. Since graduating from Ball State in ’05, he has been a substitute teacher and a track and cross country coach. While at Ball State he was a member of the cross country and track teams, and continues to train for races of varying lengths. This winter Alan has gotten re-invigorated about the sport, his own training, and is excited about what his future in the sport holds for him.